You just never know what you’re going to find when you’re out recreating in Montana. Apparently, humans aren’t the only beings that like our state’s ski resorts–Big Sky Resort, to be specific. 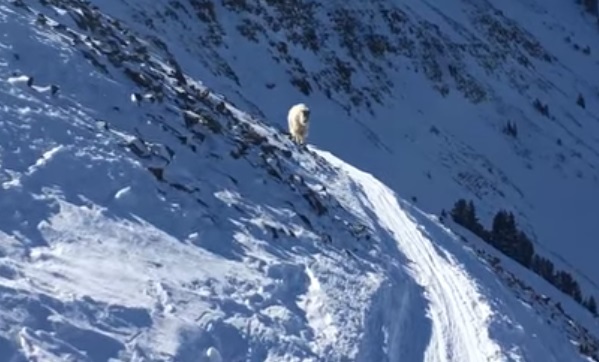 This mountain goat wasn’t necessarily skiing, but it probably loves the view from up there. A funny thing happened on the way to dropping into Coldspring, a double black ‘headwaters’ chute at Big Sky Resort, Montana. Reaching the chute requires a long traverse, or skiing laterally, on a narrow path of packed snow over rock bands; though you pass above one other chute, there is no way to cross the steep slope of loose rock to reach it further below. You can only go forward. But where the traverse bends around the corner and out of site, I spotted an elvish white thing, a shaggy-warm mountain goat standing in the sun. I paused, warm myself with awe. He was beautiful! How often does one get to see a goat, well, being a goat at 10,000 feet? I didn’t want to scare him off, and kept still.I had just met a couple from Idaho who were hiking with skis on their backs, and like me, were trying to reach a further-out headwaters run, Firehole, which required boot-packing along a ridge. But patrol had just gated off access to the ridge for the day. We were in the same boat, we laughed. I had learned that they had skied with a fellow instructor that morning, and so invited them to hike just the 20 feet up with me to reach the high traverse into Coldspring, still open. How was the morning? I asked. They had ripped the Big and North Summit. Ooh did you see any goats I asked. They hadn’t, and later admitted to wondering what the hell i was talking about. Though the gentleman was a ski instructor himself, clearly his home mountain didn’t have goats. I now turned back 200 feet to where they had taken their skis from their packs and were putting them on, and waved my hand, pointing. ‘Goat’ in a loud whisper. I wanted them to see it too, and waited. After a minute, I decided I had to move forward, and after taking a few still pictures, decided to carefully hold the camera phone to get the video. A fellow ski instructor says a goat can become defensive and push a skier over cliffs, but Big Sky ski patrollers say that these goats are accustomed to seeing them work high above timberline. In any event, this one was beautiful, on a beautiful day. Moments like these make my lifestyle one worth living!